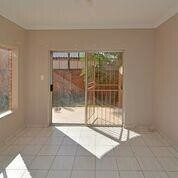 Sign up and receive Property Email Alerts of Apartments to let in Mayville, Pretoria. Layout and specifics : This unit is in a secure and safe building. The unit is tiled throughout with modern finishes and an open plan feel. Built in cupboards in a spacious room. Parking is available on request The living area leads onto a balcony or to your own private garden. To view - Please phone the office to arrange a viewing. Sign-up and receive Property Email Alerts of Apartments to let in Mayville, Pretoria.